It's been a hot minute since I posted anything art-related - which, in honesty, is crazy considering how much time I spend creating, reading, or researching different types for constant inspiration. BUT anyway, below is a selection of awesome art that I discovered on the magic that is Pinterest (of course). I'm always attracted to images that use a bright/neon pop of color as an accent or background, but as of late, I'm really obsessed with art that mixes real-life photography with illustration. I CANNOT GET ENOUGH OF IT. If you have any artists you think I would dig, send them my way! Check out some of the coolest art the interwebs has to offer, below. All images were taken from Pinterest. I'm a huge art lover - especially when it comes to bold prints with bright colors. Since I've been decorating a lot lately with my recent move, I've been trying to get a set "look" for each room. I kept the main living space art selection black and white, since I have so many other eye-catchers in there (pillows, table decor, candles, throws), but plan on filling the guest room and office with lots and lots of bright, bold prints. I love the gold foil skeleton (because gold! and skeletons!) 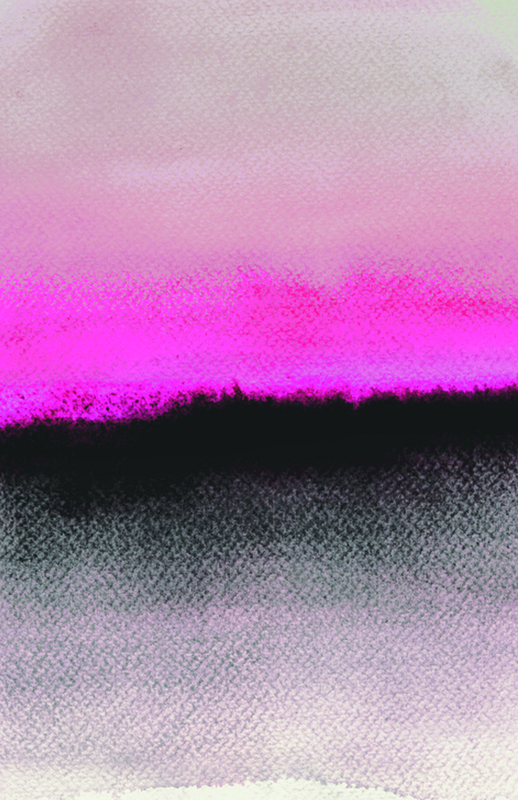 and the beautifully bright pink Double Horizon print. And that bobby pin print (along with this hairbrush and this comb) would make a great little bathroom artwork series. After all, you can NEVER have enough art. I came across these amazing porcelain "tattooed" figurines here, and immediately fell in love with them. I'm not a huge fan of porcelain things, but the intricacy and modernity of these figures really captures the 2015 tattoo culture. I also love that it shows that tattooed women are beautiful, and are really becoming the new classics. You can check out more figurines at the link above, or at the artists site here, or at the gallery site here. I read a lot of different types of magazines - fashion, cooking, art, gossip (guilty pleasure) - but I seldom come across an ad that makes me do a double-take. But THIS new Vogue ad, featuring models as dolls in boxes posing in a variety of designer diggs, truly made me do a full on double-take. An incredibly awesome and ingenious idea - I'm amazed it hasn't been done before. My favorite in the series is the Chanel feature (which is surprising considering I'm not a huge Chanel fan), and Mui Mui is a close second, but they are all fantastic in their own way. Check out the others HERE! Like the title says, new year new tattoo! I've been contemplating a few different tattoos for 2015, and thought this would be a good place to showcase some of my inspirations. It's been well over a year since my last tattoo, so I've been itching to get one (or a few) for a while now. I'm loving the geometric-style tattoos I've been seeing around. I'm also really into evil eyes, trees, and moons (like 90% of my jewelry), and the constellation ones are pretty neat too. I've mocked up a few different ones via my favorite program ever - Illustrator - so I guess I'll have to narrow it down soon, considering how much of an itch I have for getting a new one ASAP. Any suggestions - feel free to leave me a note - I would love any input! THIS is really freaking awesome. London-based art duo Walter Hugo & Zoniel have installed jellyfish tanks in the facade of an abandoned building in an effort to add an element of the surreal to Liverpool, England’s Toxteth neighborhood. The temporary installation, entitled “The Physical Possibility of Inspiring Imagination in the Mind of Somebody Living,” is revealed only at night when the building’s shutter opens and the illuminated tanks are exposed to the street. Check out more photos of the amazing accompanying exhibit here. Laughing Squid posted this article recently on some really cool digitally-altered self portraits by artist Martin De Pasquale. Besides clearly being a Photoshop God, this guy's got some seriously crazy awesome ideas rolling around in that brain of his. Check out some of my favorites of his below, and more on his Facebook. Damn kid, you rock. My brother brought this art project to my attention yesterday, and I freaking love this idea. I'm jealous I didn't think of something this simple/cool. The typical Pantone color layout, with the added bonus of food! Genius.